If your New Year’s resolution involves stepping up your fashion game, you’re not alone. But making a makeover move doesn’t have to involve dumping the entire contents of your closet. Take, for example, the humble pencil skirt. A workhorse of the office wardrobe, it’s usually paired with a crisp, tucked-in button down for a professional look. And while that classic combo will never go out of style, there are a few new topside twists that will make even the most well-loved pencil look positively chic. Here are our three favorite new ways to style a pencil skirt. Go with the flow. Since a pencil skirt is typically pretty tight on the bottom, it’s OK to go a little looser on top with a semi-sheer, flowy button-down. But how do you make sure the look reads as boho, not hobo? Start by tucking in a fitted shell, like a stretchy tank, that hugs the body. Then layer the looser piece on top by knotting it at the waist and leaving a few of the top buttons open, to create a sense of proportion that doesn’t overwhelm the pencil skirt. This Laundry button-down features sheer sleeves and on-trend polka dots, while this Ralph Lauren button-down is a way to work in purple, the color of the moment. A chunky statement necklace and some neutral wedges complete the look. Pair it with a loose, squared-off sweater. Another fun way to play with proportion is by adding a looser sweater on top. Keep things office-appropriate by choosing a boatneck or crewneck silhouette, and make sure the sweater is cropped enough that it doesn’t end up covering up the natural waist of the pencil skirt and making it look sloppy. This creamy LOFT boatneck would look pretty over a classic black pencil, especially with a brightly colored clutch in hand. Or go a little funkier with this cropped white American Eagle sweater, which cries out for some cool statement heels to complete it. Just be sure to keep accessories simple on the upper half with this look– a lot of jewelry can overwhelm the clean lines. Dress up a white tee. It sounds odd, but with the right skirt and accessories, a plain white crewneck can become totally office-appropriate. This stylish cherry-red Joseph Ribkoff skirt would look smashing with a white tee, a chunky gold necklace and bracelet, and a pair of pointy-toed slingback heels like this sleek gold and copper pair from Adrienne Vittadini. Just make sure the shirt is crisp, clean, and well-fitted, and be sure to tuck it in. Been a while since you teed up? Gap tops are a favorite for everyday wear, and this white tee is no exception. Feel inspired? 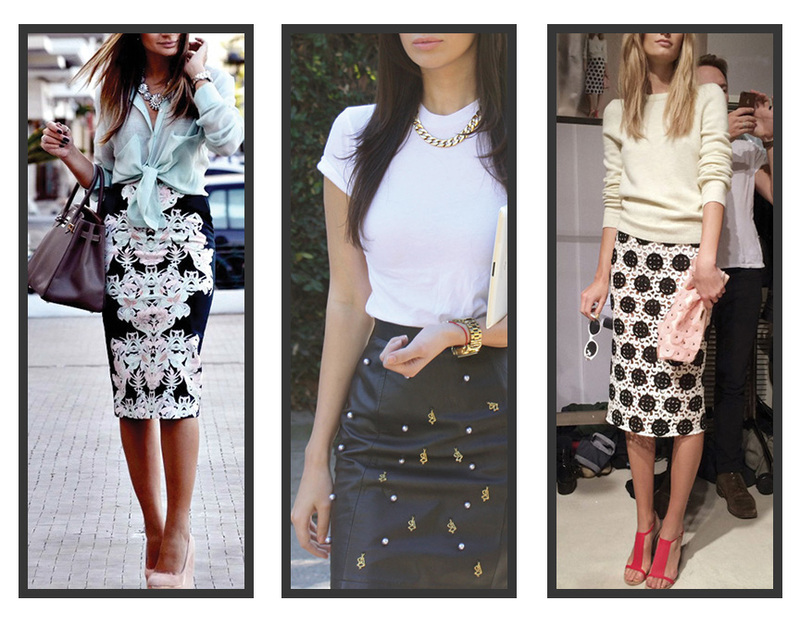 Check out our Pencil Skirt collection for more great finds. thredUP is Launching a Handbag Shop!